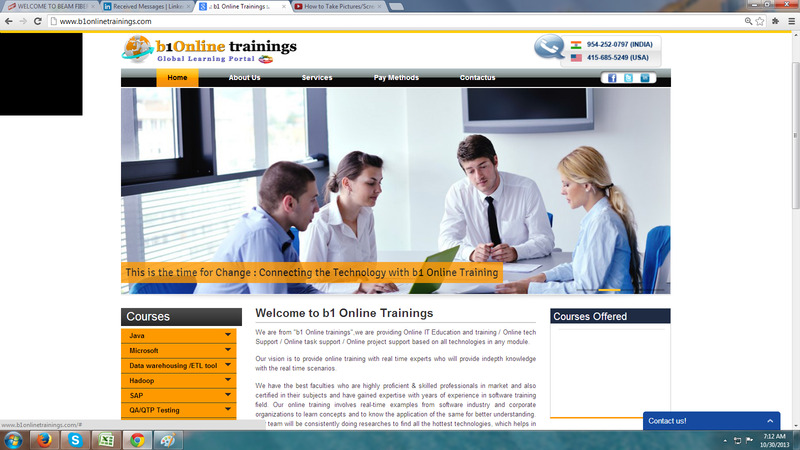 here i am Pawan from "  b1ONLINE TRAININGS   "
*100% Placement rate with prior batches at national wide clients. *Training by industry experienced professionals - most of them are certified. *Course Material will be provided according to the needs of students. *Convenient timings learn from your own desk. *We update the course syllabus every month. courses without wasting much time and money in these fast paced days of life. online software training program based on your skill set. all tech in any module as per your requirement. programs and courses that cater the requirement and necessity of each student. Your time is our main policy. You can choose your convenient time for trainings? we train them based at their capability not their number. need of relocation. You can learn from home or office. *Career counseling from the experinced trainers. *Job oriented training and Tips to empower professionalism and career. Call @ Four one Five - Six eight Five - Five two Four Nine . whats app: + 9 1- 9 5 4 2 5 2 0 7 9 7. NOTE: Nriwala.com and its affiliates, including their agents, representatives, and assigns, disclaim any and all liability from loss or damage relating to or arising out the advertisements or postings herein. Please provide your e-mail here to receive upcoming or ongoing deals, coupons, discounts or other offers.